We're always scouring the web for great bike news and gear, and today we've found another  another kickstarter project worth checking out. 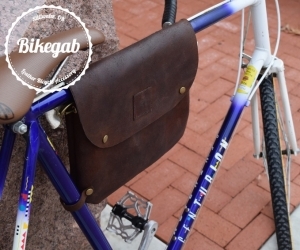 This one is the BikeGab leather bag which doubles as a frame bag (straps to the top and seat tubes) and a messenger-style bag for when you're off your bike. I really like the workmanship (based on the photographs... but if I get my hands on one, I'll report back with a hands-on review) as well as the fact that you can fully access the bag's contents without removing the bag from the bike. There are plenty of bags out there for your bike and your body, so it takes quality and attention to detail to stand out, and it really looks like the BikeGab has what it takes. Check out the  BikeGab kickstarter pageand decide for yourself.